A memorial ceremony has taken place in Limerick to remember the genocide which took place in Rwanda 25 years ago, in which hundreds of thousands of people were slaughtered in a bitter civil war between Hutu and Tutsi tribes. 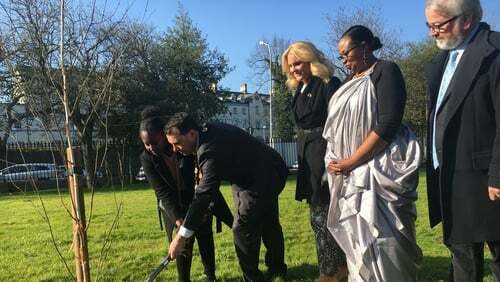 A tree planting ceremony and a commemorative plaque were unveiled by the Mayor of Limerick in Clare Street Park in a ceremony organised by Bohar - a charity group which has sent thousands of animals, including in-calf heifers, goats, and hens to Rwanda to help families become self-sustained over the past 28 years. Mayor Collins said they wanted to express solidarity with the people of Rwanda because of the suffering they endured and to mark the healing the Rwandan nation has undergone in the intervening years. Also attending the ceremony was Chantel Mutesi, who lost her mother, sister and four brothers in the genocide, and who fled to Ireland with her 3 week old daughter because of the war there. She now lives in Carrigaline, Co Cork, and said the memories of that time are still raw and extremely difficult to talk about. But she is very grateful to the Irish people and to her neighbours and friends in Ireland and Cork for making her welcome here and for helping her get on with her life. She hopes to visit Rwanda in May along with her daughter who is now 25 for the first time since the war.